Friends of Princeton Open Space and REI are encouraging the Princeton Community to OptOutside and enjoy nature this Thanksgiving weekend. 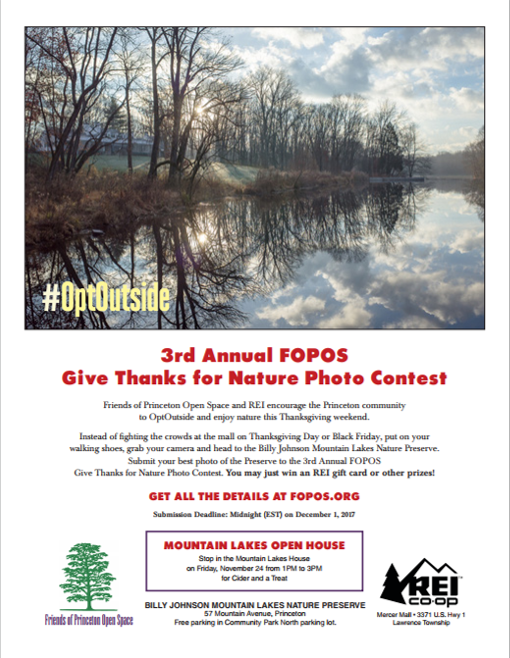 Plan a visit to Mountain Lakes Preserve on Thanksgiving Day or Black Friday and bring your camera to participate in the 3rd annual FOPOS Give Thanks for Nature Photo Contest. Take your best shot of all that Mountain Lakes Preserve has to offer, and submit your photo for a chance to win an REI gift card! Mountain Lakes Preserve is located at 57 Mountain Ave, Princeton, NJ 08203. Contestants can park at the Community Park North parking lot. DO NOT send files with your camera's default filename! In order to ensure anonymous judging, please include no signatures or watermarks that would reveal the name of the photographer on the photo itself. Entries must be submitted by midnight, Friday December 8th. Please e-mail jpeg files to info@fopos.org, with Photo Contest in the subject line. The photographer retains full copyright to his or her images. 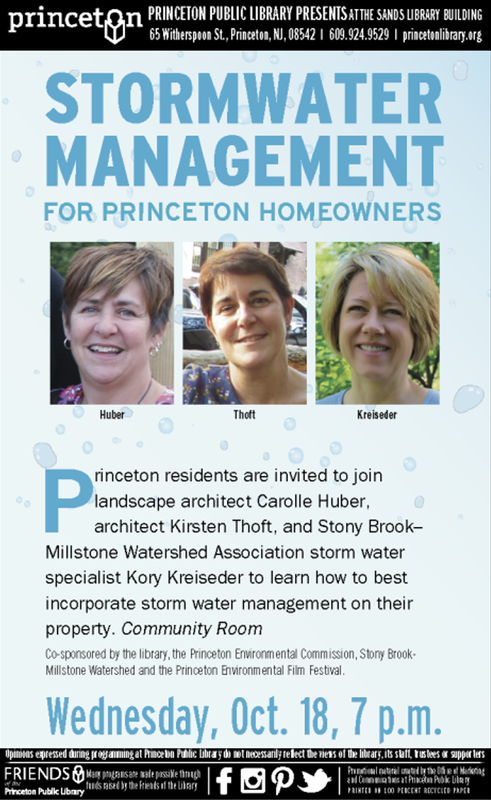 However, participation in the contest requires the contestant to give Friends of Princeton Open Space permission to use the photographs without compensation on the website as well as in news releases which may appear in print or on third party websites for the purpose of publicizing the contest. Friends of Princeton Open Space will always include the photographer's name when using a photograph for any purpose. New Jersey has tremendous natural and geographical resources. Its abundance of clean water, wildlife, and forests, its network of rivers, and convenient location between two of the largest cities in the U.S. makes New Jersey a natural a center for manufacturing & business. With these attractive assets comes a history of industrialization. With industry comes pollution, through major spills and pollutants left behind in the environment. New Jersey’s natural resources belong to all of us. When they are polluted, damages must be paid. New Jersey’s history of industrialization has resulted in some of the strongest anti-pollution laws in the country, which hold companies responsible for cleaning up industrial pollution, as well as compensating communities for actions that damaged the environment. Payments assessed against polluters to compensate for injury to and lost use of the environment are known as Natural Resource Damages. New Jersey’s Natural Resource Damages program requires polluters to pay the state for lost use and restoration of natural resources, such as wildlife, habitat, water, or wetlands, due to pollution. For example, the waterfront park in Newark along the Passaic River and dam removals to restore fish passage along the Raritan River were funded with Natural Resource Damages. These restoration payments are separate from cleanup costs. Natural Resource Damages are incredibly important for assisting communities that have sustained sudden, unanticipated pollution spills or have suffered ongoing toxic discharges, sometimes for generations. These funds help them recover. But recently, Natural Resource Damages have been raided from the communities that deserve them and redirected to balance the state budget. Many polluted communities are disproportionately urban and low-income. 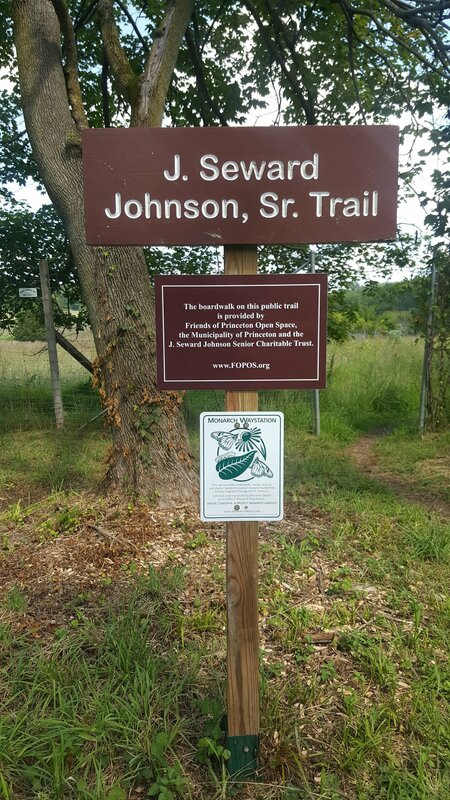 Many impacted communities, such as Newark, Elizabeth, Camden and Linden also have limited outdoor recreational opportunities. Pay the legal costs for environmental contamination claims. This amendment would dedicate moneys collected by the state relating to Natural Resource Damages through settlements or awards for legal claims based on environmental contamination. These moneys would be dedicated to repair, replace, or restore damaged natural resources, or to preserve the state’s natural resources. The moneys would be spent in an area as close as possible to the geographical area in which the damage occurred. The moneys could also be used to pay for the state’s legal or other costs in pursuing the claims. Currently, these moneys may be used for any state purpose.